This was the tenth ball put on by the association. Included variety sketches, the dancing part of the ball took place following the wrestling match. Roeber is noted as the champion of Germany in the build up to the match. Herbert refused to show up and thus Roeber was awarded the prizes. One source states it was a "$50 Gold Medal", Roeber recalls he won the "Amateur Championship" on this night. There was also boxing and club swinging on the card. The boxing took place before, inbetween and after the wrestling bouts. The show also featured boxing, tumbling and Indian Club Swinging. Roeber is listed as the Champion of Germany. Daly is said to be training in Far Rockaway with James Quigley. Roeber is said to be training at Oak Point with James Pilkington. On September 13 the bout was billed as for the American Championship. On September 17 the bout was billed as for the World Championship. Due to a lack of audience present the show was postponed. Richardson was a substitute for Captain James C. Daly. Richardson was said to be the training partner of Daly. Roeber is noted as an ex-amateur Champion. Believe it took place sometime around here. Miller had to pull Sorakichi off of Rober following the time-limit expiring. The audience were unpleased with the decision, but the wrestlers seemed fine with it. Before the contest Mueller smashed rocks with his fists and the Hirshkind Brothers played on zithers. Hoefier claimed he had to quit due to suffering from malarial fever and he will challenge Roeber again for double the stakes once he is up to health. One source states the match lasted 18 minutes. The Brooklyn Daily Eagle lists this match as taking place in New Haven, Connecticut. Featured boxing and wrestling with Roeber, Felix Vanquelin, Mike Donovan, Cleary, Andy Bowen, Bezinan, and John Duffy. Other than one boxing match, no others are listed. Volting is noted as the champion of Central Turn Verein. Awarded the American/World Graeco-Roman Championship from William Muldoon. Possibly awarded prior to this date, but this is the first mention in newspapers of it that I have come across. Evening performances by Roeber & Muldoon displaying the science of Graeco-Roman Wrestling. Performances by Roeber & Muldoon displaying the science of Graeco-Roman Wrestling. Performances by Roeber & Muldoon dusplaying the science of Graeco-Roman Wrestling. In the second fall Robinet complained of pain in his ribs on his right side. He said that he had injured them in training recently. Judges: Sam See (for Lawrence) & Steve Drolls (For Roeber) - Visibility bad on article names may-be slightly misspelt. Lawrence is noted as the champion wrestler of Germany. 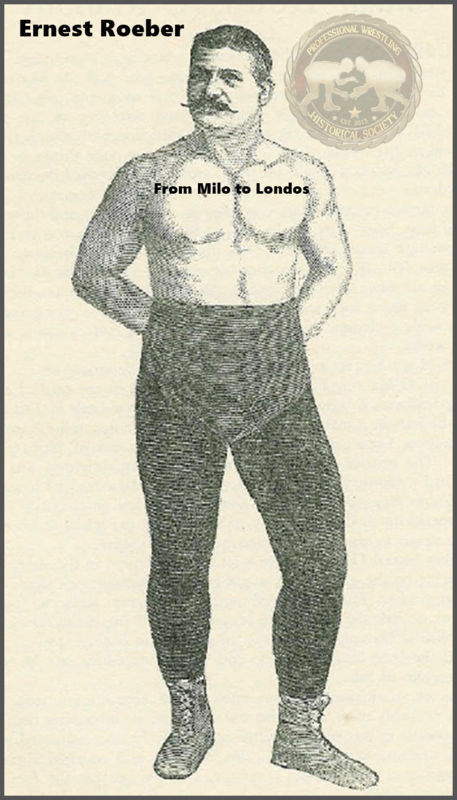 It is noted that the match is Catch-as-Catch-Can, however, I feel this is an error given previous articles (See May 21 & April 20) and that Roeber was a Graeco-Roman wrestler and it was for the championship. Roeber is listed as the American champion going into the contest, and Apollon the French champion. Show also featured boxing, fencing, and football exhibitions. Roeber is noted as the present champion. Kernan's Lyceum Theater, Washington, D.C.
William Muldoon's athletic crew perform with the 'Me and Jack' one-man comedy act presented by Lester & Williams as well as a vaudeville entertainment comedy act 'Mrs. O'Reilly's Party.' Muldoon also had boxers. William Muldoon's athletic crew perform with the 'Me and Jack' one-man comedy act presented by Lester & Williams as well as a vaudeville ascertainment comedy act 'Mrs. O'Reilly's Party.' Muldoon also had boxers. Lester and Williams's "Me and Jack" was the the main attraction. Boxing matches and a "Me and Jack" company performance. Marks is a pupil of Cyclops. Other athletics took place and a "Me and Jack" company performance. This was due to Marx staying with Roeber the other night. Other athletics took place (most likely including Roeber) and a "Me and Jack" company performance. Roeber is listed as the American champion. Karl is listed as the South American champion. Also features the DuRell twins, the Bouita trio, other musical performances, ventriloquism, dancing, and comedians. Performance by William Muldoon's athletic troupe, including Ernest Roeber. Billed as the last opportunity to see these noted athletes together. Evan Lewis has challenged the winner. Atila replaced P.J. Donohue who was ill.
Roeber is noted as the pupil of William Muldoon. He is also listed as the World Graeco-Roman Championship. Ross is listed as the champion all-round athlete. One article notes this is for the championship of the world, unclear which one it refers to. No others do. Most likely the Mixed Championship. Ernest Roeber, William Muldoon, and Romulus appeared along with boxing acts and vaudeville entertainment. Muldoon noted as the retired champion, Roeber as the current. Other sources note that Roeber drew Nogat and that Nogat defeated Roeber. Wrestlers Jakob Bauer, Heinrich Niemann & Paul Johnson all attended the match. 1 - Ernest Roeber def. ???? 2 - Ernest Roeber def. ???? Roeber claimed that after the fourteen minute mark, Abs, "ran out of the ring. I shouted after him to come back, but he refused. He said he had enough." Thus in Roeber's account he won the match and it was not a draw. This is partly from an interview with Roeber in 1921. This is in mid to late October. He moved to Wúrzburg afterwards. Roeber proclaimed himself "Champion of the World" after defeating Gilles. Zinsinski is listed as the champion of Russia. Roeber is listed as the champion of America. This is from an interview with Roeber in 1921 - Possibly not from this time frame, but seems likely as Roeber was in the area. Possibly happened in March 1895. Niemann wrote that he wrestled against Roeber in the above place. This is Roeber's last appearence in Berlin. He left for Hamburg afterwards. These matches were filmed via "electric camera." Bernau is listed as a local celebrity. The match had to be stopped when Bernau suffered an injury in his side either at the end of the second fall or during the third. Peter Maher versus Bob Fitzsimmons was the main attraction of the evening. Bob Fitzsimmons, Dan Hickey, J.H. Shoemaker, Fitzsimmons' temporary manager until paired back up with Martin Julian, R. Davies, from the New York Journal, Bob Cole, of the New York Herald and Ernest Roeber arrived together in Salt Lake City today. They're staying at the Templeton Hotel. Fitzsimmons also sparred and gave boxing demonstrations. Roeber was listed as the Graeco-Roman World Champion of the World. Fitzsimmons also gave a boxing exhibition with bags, and a sparring session with Dan Hickey. Martin Julian made several speeches through-out the evening. The Fitzsimmons was the main feature of the event. The preliminaries which Roeber was a part of were said to not capture the audiences attention. It's announced tomorrow at the same venue that Ernest Roeber will wrestle Bob Fitzsimmons. Said this will be worth watching. The match is mentioned in the results for the night before, but not in the results for the night of the 6th. "Fitzsimmons and his aggregation gave another show at the Gilliss last night to another good house, although the theater was not packed as on Monday evening. The programme was virtually the same except that Dupont wrestled with Louis Herbach and Mellody and Gozell went on for a three-round sparring contest. Julian and Fitz repeated their talks of the previous evening and were well received. Fitzsimmons and his party will leave for St. Louis this morning." Was scheduled to be Fitzsimmons versus John L. Sullivan in a six round, friendly boxing match, however, the police forbade it and said if they even got in a fighting stance they would be arrested. Miller has been taking lessons from Ernest Roeber for two months. Show also featured a weight-lighting exhibition with Fred Winter and Louis Wohlleben. Today is the first show of the week. Two shows matinee and evening show (Not clear if Roeber is on both shows, only listed what is definite for him). Beck was listed as champion of Germany. The main feature was Bob Fitzsimmons sparring etc..
Show also featured aerial grotesques, a comedy scketch, Irish comedians, the Crane Brothers, the original Mudtown rubes, singing and dancing, burlesques, and a clown and juggler. Attendance: "Crowded to the Doors"
The primary attaction was boxing champion Bob Fitzsimmons. Roeber is said to be the champion of America. Beck is said to be the champion of Germany. Roeber said to be champion of America. Beck said to be champion of Germany. The exhibition was said to be clean and satisfying between Roeber & Beck. Carl Roeber is noted as being a "gladiatorial wrestler." It most likely means Ernest Roeber, but could be referring to Carl Beck. The show also featured a vaudeville section as well as Bob Fitzsimmons various sparring and bag exhibitions. It's speculated by papers in the lead-up to this series of events at the Grand whether Dwyer, Schott, Smith, Quinn, Kasten or Baptiste will accept Roeber's open challenge. Roeber is listed as the Graeco-Roman Champion of the world. Beck is listed as the champion of Germany. Bob Fitzsimmons was the main attraction of the show. The show also featured aerial grotesques, 'At the Lunactics' Ball', singers, comediennes, dancers, burlesque Irish comedians, sketch artists, instrumentals, descriptive singing, burlesque artists, and a clown juggler. Was identical matinee and an evening shows today. Roeber was not listed in the write-up of the events in either the New York Sun or New York Times. Yousouf was mentioned in the New York Times, but not what he did. Both were listed in the Kansas City Journal. There was much discussion as to whether Roeber and Yousouf was a worked match or not. Some felt that it was, others felt that Roeber was merely a coward. The disqualification happened when depending on which paper you read, Roeber either jumped off the stage to get away from Yousouf and in the process injured himself, or, was pushed off the stage by Yousouf and got injured that way. It's for that reason the legitimacy was in question those who thought he pushed thought the disqualification was justified, those who thought he jumped felt it was a complete sham to give Roeber the victory for being a coward. Dan Hickey was also with Roeber. Yousouf's manager, Brady, offered to let him give an exhibition with Tom Cannon after the last match, Chief McCallagh refused to allow it though. Bob Fitzsimmons was the main atraction. Also featured Mrs. Julian Burkhart, The Beautiful Theo, Eckert & Berg, Lewis & Ernest, Mulvey & Inman, Vanleer & Barton, Crane Brothers, Willett & Thorne, Yank Kenny, and other acts. Also featured Mrs. Julian Burkhart, The Beautiful Theo, Eckert & Berg, Lewis & Ernest, Mulvey & Inman, Vanleer & Barton, Crane Brothers, Willett & Thorne, Yank Kenny, Carl Beck, and other acts. Kansas City Journal wrongly lists the match as taking place in Madison Square Garden. Kansas City Journal also notes that Pardello travels with Roeber. The New York Times is the only paper to list this as for the world championship. They had previously announced this would be a tournament match with the winner facing Heraklides 'the Greek' on May 7. 1 - Ernest Roeber def. "Atlas"
Muller is listed as the South African Champion. Roeber & Crane Bros. Vaudeville-Athletic Co.
Roeber is listed as the World Graeco-Roman Champion. Sheerer is listed as the German Champion. Also featured the Mudtown Rubes, Alf. Grant, West & Williams, Rosalie, Ford & Dat West, Misses Maxwell and Dixon, Love & Lamont and LeClaire & Leslie. No mention is made of Scheerer in the write-up. Scheerer equals Sweeney possibly? Jack Skelly said he had an "Unknown" to face Roeber tonight. He was very anxious to get his man a try, so much so, he even offered $10 to Sweeney to stand down. Sweeney refused and Skelly was told his man would have to wait until the next night. Atlas was Jack Skelly's unknown. Roche is noted as being the manager of 'Mysterious Billy' Smith, the boxer. McGee is noted as knowing every trick in the trade and as have given top names a run for the money although not able to throw them. Atlas is listed as a local wrestler. Roeber listed as the world champion. Cleary listed as the northwest champion. Mentioned that this is the first public wrestling match for years in Boston. Muldoon is listed as the brother of William Muldoon. Schnerrer said to be a "Big strapping German heavyweight lifter." The match broke down into a fist fight at it's conclusion. Roeber is billed as the top act and as the wrestling champion. Also features: "Alfred Grant, in a comedy sketch; Rosalie, in songs and acrobatic dances; West and Williams, in 'The Colonel and the Count'; Daly and Devere, in an Irish sketch; Misses Maxwell and Dixon, in top boot and transformation dances; Ford and Dot West in a sketch 'The Waiter and the Maid,' and the Crane Brothers in their specialty as 'The Mudtown Rubes.'" Results of Corbett-Sharkey fight to be read from the stage. Also features: "Alfred Grant, in a comedy sketch; Rosalie, in songs and acrobatic dances; West and Williams, in 'The Colonel and the Count'; Daly and Devere, in an Irish sketch; Misses Maxwell and Dixon, in top boot and transformation dances; Ford and Dot West in a sketch 'The Waiter and the Maid,' and the Crane Brothers in their speciality as 'The Mudtown Rubes.'" Roeber & Crane Bros. Vaudeville Co.
Was originally supposed to take place in Brooklyn the week prior, but Clearly had a "serious illness." Cleary is listed as the Northwest Champion. Roeber will perform exhibitions with George Lawrence & James Faust. 1 - Ernest Roeber def. Scheerer "the Terrible German"
Roeber offered $50, via his backer, to throw any man in fifteen minutes following the above match. Prof. Jim Adler, of Boston, offered to accept a match, Roeber ignored him at first. Adler and the audience continued shouting at Roeber, his brother Billy, offered to put up the money and Adler got up on the stage. Adler stated Roeber would not wrestle him. Roeber ordered him off of the stage and pushed him into the wings when Adler refused. The audience were set to rush the wings had policemen not been present. Roeber explained that Adler wanted no stranglehold and no flying or rolling falls to be allowed and they were impossible rules to be put into place for a fifteen minute handicap match. Roeber is listed as the World Greco-Roman Champion. Before the match happened Atlas, who is said to be the Boston Champion, challenges Roeber to a match. Roeber declines stating he has a match with Faust already. Atlast then dared Roeber and implied Roeber was chicken. The audience hissed Roeber when he again declined. Atlas stripped off ready to fight. Roeber pushed Atlas, the two men went to clinch, but Padella (Roeber's wrestling partner) separated the two men. Atlas did hit Roeber with a fist that cuased the blood to flow though. The police finaly intervened so as that Roeber could continue the show and face Faust. Muldoon is noted as brother of ex-champion William Muldoon. Also featured a stone breaking contest between Mons. Laurent (with the show) and Bert Bartram (of Buffalo). No reason on why the card changed is given. Adali is listed as "Al Reeves' 'Terrible Turk." The contest was on a raised stage in open air. Won the first fall with a half-Nelson. Mitchell had to forfeit due to a dislocated shoulder during the match. This match came about due to police threatening to arrest Jeffries if he put on a boxing exhibition. The date is that of when the cablegram announced in America, the match actually took place earlier in September. Police gave warning prior to the bout that it must end at midnight. Nouroulah lost his temper and rushed Roeber to the mat and commenced in fouling him. Said to be the last match of Nouroulah in America. Roeber announces his retirement following this mathc and vacates the American/World Graeco-Roman Championship.